Dutch fashion brand Articles produces 2 seasonal fashion catalogues per year, Spring/Summer and Autumn/Winter. 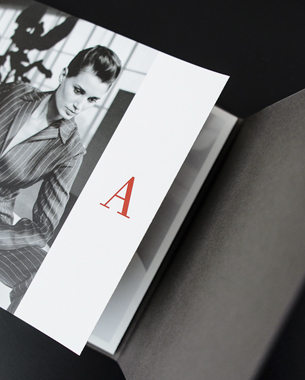 With the range split into smart and casual, 2 separate booklets were created using a unique concertina folded inner. Black and white photography was used for formal and colour for casual. The booklets were assembled by hand and bound together with a semi-opaque band.